We were getting some killer Okanagan Sunsets. I hate to say it, but all the smoke from wildfires in the area made 'sunset light' long before sunset which is pretty cool, so I thought it was ideal time to plan a beach shoot to update my portrait work portfolio a bit. The shoot went great, but the sunset fizzled out a little, it was the first day in weeks we had a cloudy sunset. Regardless, we did get a few pockets of light and certainly made the most of what we had! Here's a look at the product of our shoot, the set up I used (and tested) and more. 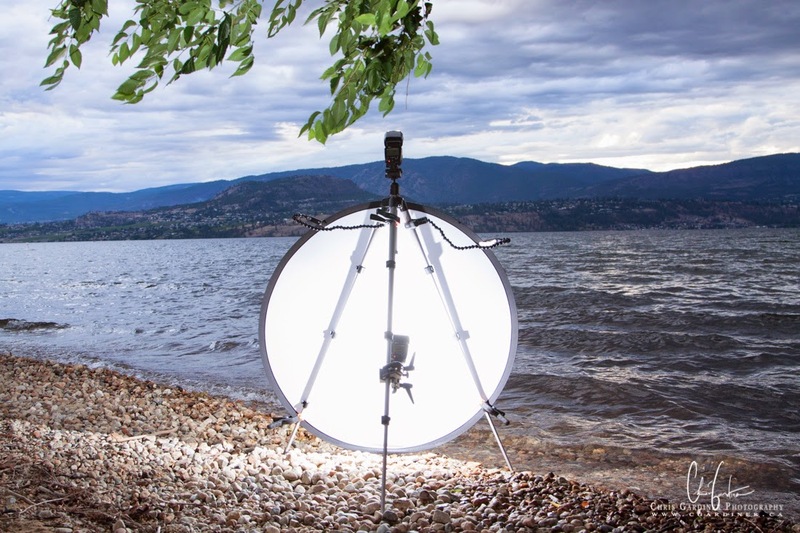 So the setup I used was a test setup, I wanted to try an ultra light, mostly all terrain lighting system that will a) fit in a backpack, b) usable by one person in most conditions c) and of course, last but not least, make my subjects look good. It was quite windy this day, which doesn't help your lighting situation more often than not, and I was also working around water, which is very dangerous for your lighting equipment more often than not, so this was a good one of many different challenging terrains to test it in. -A couple of hand clamps to secure the defuser to tripod. The only real compositions to show the beach involved shooting straight at the setting sun with the model being backlit, I was ready to fight the sun for the early portions of the shoot but it wasn't needed with the clouds we had. But, the lighting I pictured pre-shoot was : sun to be my rim/backlight, my diffuser and dual 600RT flash combo to be my key, and the reflector to be some on axis fill if the sun was very strong. I've used this 'rough lighting recipe' on people before in environmental settings, but not yet on a beach, which I thought it would work particularly well for. Brooke is an aspiring model who was actually visiting Kelowna from Alberta who was looking for a photographer to work with. So I always welcome the opportunity to photograph a visitor who can 'bring my work' back with them to new viewers who I would have never reached before. So I've included a shot of the setup I used in the water, and then a bunch of the images we made. There are no lighting diagrams since more often than not, I move my lights side to side, vary their power, adjust for ambient, many times through a photoshoot. I had one of the 600RTs up top, on the actual quick release plate of the tripod, it had the bounce card up and was at a 45 degree angle, and I had one on the super clamp with an umbrella bracket and cold shoe connected to the back leg of the tripod shooting through the diffuser.